Some in the industry call a solar pool heating system with a heat pump or gas heater a Hybrid Solar Pool Heater. I prefer to call it a solar pool heater with auxiliary or backup heater. The word ‘hybrid’ is a bit overused in the industry, and can be misleading. Integrating Solar Pool Heaters with existing heat pumps is common. Nonetheless, pairing an auxiliary heat source with a solar pool heater can be an ideal solution for some people, especially those who demand particular pool temperatures year-round. If you want your pool a particular temperature all the time, and operating cost is a secondary concern (cost is rarely a complete non-issue), you might consider installing a solar pool heater to reduce the demand on electricity or gas auxiliary heaters. Solar pool heaters can be installed concurrently with, or as an addition to an existing heater. Solar Pool Heaters can also be connected to existing automation systems. 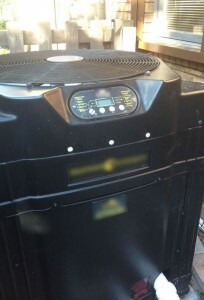 Most people with hybrid solar pool heating systems use auxiliary heaters on an on-demand basis, whether controlled manually or with an automated controller. Automation systems can use what’s called solar priority mode. This allows solar to operate when practical, and backup heaters to operate when solar heating is not feasible, to attain a desired temperature. This often results in the best of both worlds, balancing heating expectations and energy savings. However, solar priority mode can also result in unneeded and wasteful auxiliary heating costs when the pool is not being actively used. In my next article I will explain the pros and cons of each heating system. While a single heating source may work for you, you may find a hybrid solar pool heating system is best suited for the way you wish to use your pool. Previous Post: My FPL Solar Rebate Check Arrives!